For most students, going back to school means new school supplies, seeing old friends, and getting to know new teachers and friends. 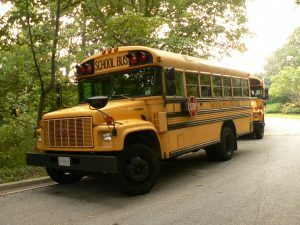 A majority of those students will take the bus to school each day. Walk your child to the bus stop on the first day so that he or she knows where the stop is; from there, you can go over the rules one more time. Tell your child to stand back at least three giant steps from the curb. When the bus approaches, remind your child to always wait until the bus stops and the doors open before making any movements toward the bus. Once on the bus, your child should pick a seat and stay seated until arriving at school. Remind your child that they should behave while on the bus; never do anything that will distract the driver from the road. If there is an emergency, tell your child to stay calm, be quiet, and listen to the driver’s instructions. When exiting the bus, tell your child to make sure that they take two big steps away from the bus before turning; that way, the bus driver can always see them. Remind them to always look for cars and to make sure that the cars are stopped before crossing the street. If you are following a school bus, leave an ample amount of room between you and the bus; school buses stop often, and you should allow yourself extra space to stop. Don’t forget what the flashing lights mean; yellow flashing lights indicate that the bus is preparing to stop and load or unload children. Red flashing lights and extended stop arms mean that the bus has stopped and that children are getting on or off. When a school bus stops and puts on its flashing red lights, you must stop. Again, leave an ample amount of space between your car and the bus, and wait for the lights to stop flashing. Watch for the bus to start driving again. Even if you are headed in the opposite direction of a school bus, you need to stop if the school bus has its stop sign outstretched, crossing arm activated, or lights flashing. Wait for children to unload and cross. If you want to pass a bus, wait until it is safe to do so; never pass a school bus while it is stopped to load or unload. Be alert for children crossing in the middle of the street. Some kids won’t think to check for vehicles if they are late or talking with friends.